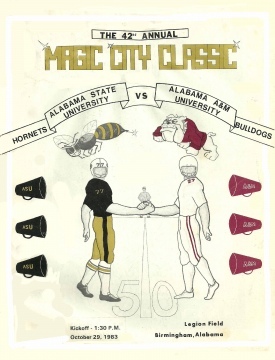 The first game kicked off in 1924 and the Black communities in the state of Alabama turned out in large numbers to support the proud college football teams of Alabama State University and Alabama A&M University. They came to cheer for their local heroes as well as enjoy the high stepping marching bands. The fledging rivalry ended briefly in 1932, and resumed competition in 1940. Again, the late October game was interrupted during World War II (1943-44). Since 1945, it has become one of the most highly attended black college football games in the country. The epitome of their longevity was rewarded in 2009 as attendance topped out at 61,879. The excitement starts with one of the largest black college parades that annually draw 100,000 spectators.